With many Customers request, our hostel has put much effort to upgrade our facilities and extend our room type. 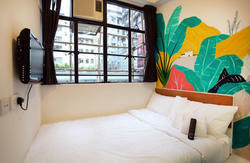 This hostel is famous in Hong Kong because of the long-term hospitable service with honest attitude. The hostel owner has over 30 years hostel management experience, she knows much about what the customers need and she will try her best to help customers. Thats why so many tourists make friends with her. This hostel has achieved 3-star hotel standards. Although it looks like a hotel, we only charge hostel price. Its cheap, snug, clean, safe & located at the core of Hong Kong where a shopping mall, museum, street market, transportation and restaurant all surround us. All rooms are extremely clean and have washroom, air-conditioning, internet, fridge, TV, and telephone. We have a license on safety and have 24hours security staff and receptionist. 1. *Prime Location* convenient to access and can go anywhere easily! The New Hong Kong Hostel is famous in Hong Kong and it lies at the centre of Nathan Road's Golden Mile shopping paradise. Situated in Chung King Mansion, this hostel is just steps away from the spectacular Victoria Harbor and the shopping hub of the city. Being easily accessible from many tourist attractions, the New Hong Kong Hostel is just a 10-minute walk from the Star Ferry and the China Ferry Terminal. 2. *Clean Rooms* customers will enjoy comfortable staying with the big beds! The New Hong Kong Hostel has renewed in 2011 and comprises 30 guest rooms, all of which include facilities for business and leisure travelers. This hostel offers guests a modern balance between value and convenience. Our rooms are clean and much cheaper compared with other hostels and hotels in Hong Kong, with the same standard. Because our hostel has just renewed and want to attract new guests, we are now promoting the lowest room rate that you cannot find anywhere else in Hong Kong. Rooms include air-conditioning, internet access, telephone, washroom, TV, fridge, desk and towel. Double - Economy, Standard, Luxury (all included private bathroom)and the room type Basic Double Bed Private Shared Bathroom is for the couple budget travellers who are looking for cheap rooms but not dorm and the room is 1 Bed with shared bathroom. ---The Room We show on Interent have Superior Room(the first one) and Standard Room.And the price in this site can be the Best and Cheapest price of our Hostel,most is the Standard Room Price.And the Superior and Deluxe Rooms only each 3 Rooms available.Providing Quality Room with Cheapest Price.We have more Rooms Types available which can be cheaper or expensive,please mail us Luckyhousejoeyahoo.com.hk for Enquiry. 3. *Facilities* we have input many useful facilities in guest room and our hostel. We have internet broadband access in all guest rooms and in the lobby of our hostel. There are some mini-fridges in guest rooms and one common fridge in the lobby. All guest rooms are equipped private bathroom with hot water, cooler, air-condition, color television with Cable TV and ESPN. Cleaning Towel and soap is provided in all guest rooms. Also, there are telephones in all guest rooms and customer can use it to get unlimited free local calls. 4. *Services* trying our best to make customers feel comfortable is our aim. We provide laundry service, morning wake up call service, ironing service, food ordering service, China Visa service, soft drink, coffee, milk, and tea selling service, multiple charges. Bottled water is free of charge in our hostel. If customers want, we can pick customers to the Air-port Bus Station or guide customers to sight-seeing places. 5. *Security* very safe and 24 hours security guard is on duty! Different from other hostels, we have our own security guard to look after our hostel. They are very friendly, helpful and honest. Furthermore, all the rooms have lock and customers have their own keys. Nobody can enter their room without request (including our staff). 6. *Staff* extremely friendly, hardworking, honest, patient and helpful! Our staff is well-trained and they can speak fluent English, French, Japanese and Mandarin. Our reception is 08:00-23:59, and the reception is 08:00-23:59 and welcomes all the customers enquiries and give customers tour information all the time. 7. *Global Restaurant* enjoy delicious food here! Global Restaurants (over 100 countries cuisine) surround us. Guests can choose which one they like. There is also a bar and cafe just next to our hostel. Guests travelling on official matters can make use of the fully equipped business centre, which includes a board area that can accommodate meetings for up to 6 people. Our 24 hours reception gives all the tour information to our customers. Public swimming pool, park, game zone, indoor playground is only a 2 minute walk. Train Station is next to our hostel, tourists can travel everywhere easily. 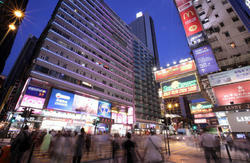 New Hong Kong Hostel is very famous in Hong Kong for its Hospitable Service. Our hostel provides plenty different rooms for tourists to choose. Our rooms are big, clean, safe, and have windows. The rooms are spacious to allow free and comfortable movement. Our professional staff keeps it clean and dustless to ensure a healthy environment during your stay. Most rooms are equipped with large windows for a gratifying view of Victory Harbor. Our rooms are categorized into three classes: economy, standard and luxury. Customers who booked rooms from this website are given the prime privilege up to 70% off of the room rate upon the selected booked and staying time on that room,please send us mail for enquiry. When customers come to our place to stay, we will give them our VIP card. Customers can use it to get 10% discount of the room rate on the next arrival. Our friendly staff is at reception 24 hours a day, so it's safe to stay in our hostel. They are there to answer all of your questions. The Mass Transit Railway (MTR Subway) exits and Train (KCR Subway) are just right at the building's entrance. It accesses most of the places in Hong Kong. The A21 Airport shuttle stops within 1 minute walk to the building entrance. Furthermore, tourists can take ferry to cross the Victoria Harbor and enjoy the beautiful sea view. Most of the transport is easily accessible in Tsim Sha Tsui for example, train, subway, buses, airport shuttle, taxi, ferry, etc. Making friends over the world is the most wonderful thing while travelling. We provide the most convenient, nice and inexpensive place with the opportunity of meeting friends. If you want to save money during your trip and enjoy the advantages we provide, we welcome you to stay in our place. (Take elevator No. 5, press 6 in the lift) for check in (New Hong Kong Hostel Reception), Thanks! Please select your arrival time carefully,Although we have 24 Hours security Staff ,but our reception for check-In is from 9A.M-12:00Mid-Night. Chung King Mansion , Block C , Floor 6 , Flat C1 . Chung King Mansion , Block C , Floor 15 , Flat C1 . and we don't have any other receptions in the same building. After entering the building,please go straight of the row,you will find Block C at the last tower,take Lift Number 6 go to Floor 15,After Coming out from the Lift.please turn right and you will find Flat C1 and our main Reception. Please don't trust anybody in the street especially some say they are the staff or manager in our hostel or the building(No matter how Indian and Chinese). They are trying to bring you to different place in order to get their comission and want to cheat money out of you.Please Dont Trust anybody in Ground Floor of the building and come to Floor 15 directly. Our Manager and staff will wait you in our hostel.If you have any questions or want us to pick you up to our hostel.Please feel free to contct us. Airport bus is the most convenient and popular method to get to Chungking Mansions. The Airbus Station is located near the Arrivals Level (Level 5) of Hong Kong International Airport. Find the Airport Shuttle Bus Number: A21 , which terminal is called Hung Hom KCR Station.Please take a short wait and get on this Number of Bus. The bus departs approximately every 10-15 minutes. A fare is HKD $33(free of luggage fee). When you are on the bus, be sure to first to secure your luggage then find a sit on the lower level. In 40 - 80 minutes (depends on traffic situation) you will reach to the Bus Stop No.14 - the name of this Stop is called : Middle Road Station, Nathan Road. Because the service time of A21 is 05:00-23:59, you can use N21 airport bus at same place and stop at the same bus stop if you arrival Hong Hong after 00:00 and before 5:00A.M. Once you got off the bus, turn the back way, and walk approximately about 50M, It takes about 30 seconds on foot. you can see the Chung King Mansions front entrance on your right hand side. You wiil see the huge TV screen paste at the wall of Chungking Mansions. When you make sure you are at Chung King Mansions, Please kindly go straight of the row to Block C ( at the last tower of the Chungking Mansions ). You can see two lift in Block C, take the right hand side one, Lift Number 6 (stop at Floor 15), push the 15th floor button, when you come out from the lift, you can see our reception should on your right hand side. K3- taking K3 to Holiday-Inn Hotel and get off there.Please after go along the Nathan Road.Turn left,you can see the Chung King Mansions front entrance on your left hand side. You wiil see the huge TV screen paste at the wall of Chungking Mansions. When you make sure you are at Chung King Mansions, Please kindly go straight of the row to Block C ( at the last tower of the Chungking Mansions ). You can see two lift in Block C, take the right hand side one, Lift Number 6 (stop at Floor 15), push the 15th floor button, when you come out from the lift, you can see our reception should on your right hand side. After entering to Chung King Mansion,Please go straight the row,and you will find Block C at the last Tower,Please take lift Number 6 (in Block C)to Floor 15.